Anything and everything you could ever need for your Siberian Husky dog from one Siberian owner to another. From training, grooming and housing to treats and special toys! Information on the breed and updates on what is going on in the world of the Husky dog. What is the Best Dog Food For Your Siberian Husky? 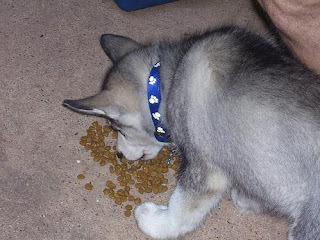 The Siberian Husky's eating habits can at times be extremely frustrating for their owners. Some days your Sibe will eat like he/she is starving and then there will be weeks where these dogs appear to eat just enough to keep a bird alive. That is the Husky's eating habits in a nutshell. These dogs are very high energy. They need a dog food that is specifically designed for high energy dogs in order to give them the fuel that they need to keep their active bodies up and running This is especially important because of their odd eating habits. When it comes to feeding any dog, the best decision to make is to purchase the highest quality food that fits within your feeding budget. While these dogs will do OK on just about any dog food, not all dog foods are created equal. The most important thing to remember is that the first ingredient should be a protein source, preferably meat. A great example of what I am referring to is to take a closer look at the dog food that I fed Sophie for the first 10 years after I adopted her. She was eating Nutro at the Husky rescue so that's what I continued to feed her after I adopted her. When you look at the ingredients list on this dog food, the first ingredient simply states that it is chicken. NOT chicken meal. Chicken. That is the type of dog food that you are looking for. 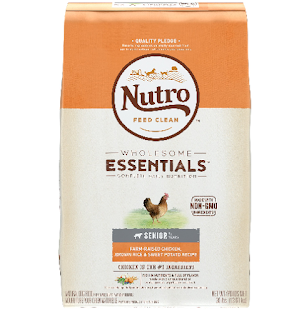 The great thing about Nutro is that it is now available in major stores like Walmart and Amazon. Back when I was feeding this to Sophie, it was only available at PetsMart and privately owned pet stores. 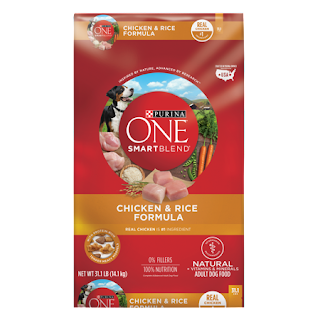 With the availability today, this dog food, in my opinion from having Sophie on it for so long, is a good food for a Siberian Husky. 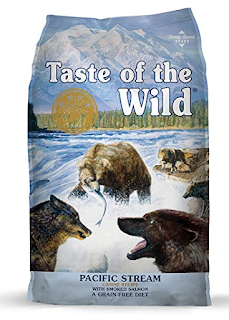 on is Taste of the Wild. I changed her food for a while because sometimes changing her food, slowly of course so her stomach wasn't upset, it sparked a new interest in eating. She really seemed to like the Pacific Stream. The first ingredient in their Pacific Stream is salmon which is a definite change from the run of the mill chicken and lamb that are in most commercially produced dog foods. My guess is that is the reason why she liked it when I changed her over on occasion. Both of those dogs foods can be a bit pricey, depending on where you get them and how much and often your Siberian Husky eats. I was never really sure how long a bag of food would really last for Sophie because just like most Sibes, some days she would eat a full bowl then other times may not touch her food at all. It could sometimes vary buy about a week. I have also fed her Purina One. In fact, that is what she is currently eating because of the fact that she is much older and her energy level has dropped so much. It is a cheaper dog food that is available everywhere, including grocery stores so it is very easy to find. She does like this dog food very much. I can't say for sure if it is the food or if it is because of her age but she does eat every day when I fill her bowl with this food. It is a good food for a good price and has worked well for Sophie. Especially since she has gotten older. Hopefully me sharing my experience with Sophie girl will help you in making the decision on what dog food to feed your Siberian Husky. These dogs can be so picky and hard to figure out sometimes and it can be frustrating. I completely understand that. I do want to close this out with one more thing... the best thing to do is to talk to your vet. 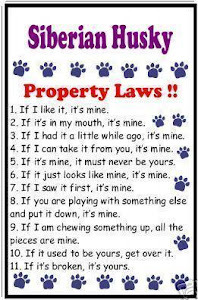 Especially if your dog is just not eating. Huskies are notorious for being odd eaters but because each dog is different, what worked for my Sophie may not work for your dog and your vet should be able to give you more solid nutritional advice that you won't really get from an article on the internet. If you have any questions, please let me know in the comment section below and don't forget to follow All Things Husky on Facebook! Fireworks aren't just for celebrating Independence Day. There are many other occasions where you might end up exposing your dog to a good old fashioned display of celebration. Just like a summer thunderstorm, some dogs will become frightened or have a raise in their anxiety level when the show starts. Many dogs become lost during these shows because they are afraid and are trying to find someplace that they consider safe. 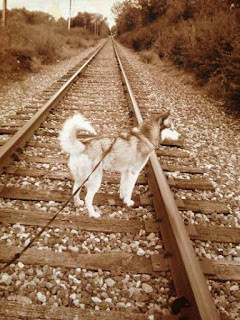 While a lot of breeds will return home, since most Siberian Husky dogs have no sense of home, if your Sibe gets away from you there is the unfortunate chance that the dog may not find their way back home. Always make sure that you dog is micro chipped and that the information on the chip is up to date with the correct address and phone number. Even if your dog is chipped, it also helps to have an identification tag on their collar with your contact information so your dog can quickly be returned to you if he or she is ever lost. If you board your dog when you go out of town, this is an excellent option for keeping your dog safe during the holiday. Whether it be at a facility that you are familiar with or a family member or friends house that watches the dog or that the dog knows, this is a good option as well. Treat it like you always do when you are going out of town and the dog will be none the wiser. If you can't board your dog elsewhere, consider using a training kennel for the evening with a peanut butter filled Kong to keep them safe and occupied. You may opt to talk to your veterinarian about a sedative for your dog for the evening. It will help to keep him or her relaxed while the festivities are going on and will help give you the peace of mind that you dog is sleeping and safe. 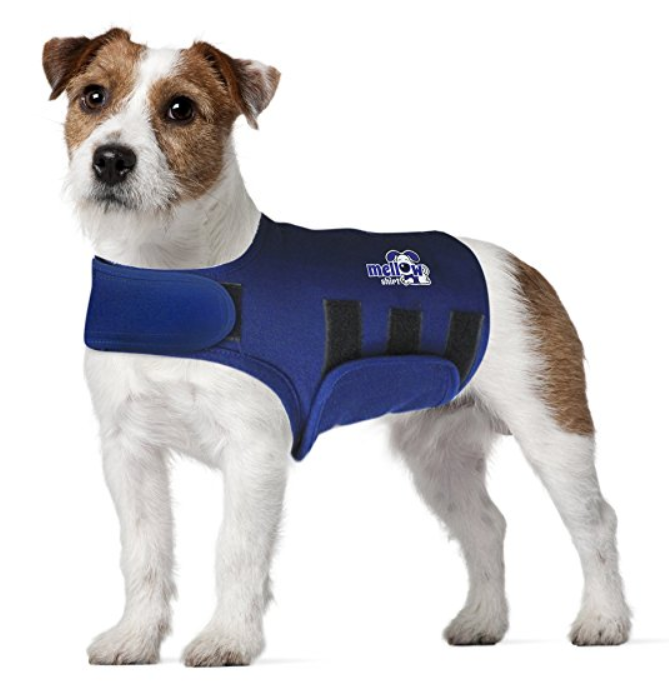 A thunder shirt works for some dogs to help with anxiety. The thunder shirt works for some dogs but not for all. This is a shirt that wraps around the dog's torso. It was originally created to help dogs that have trouble with situations that they find uncomfortable like thunderstorms. It hugs the dog's body tightly. Again, it works for some dogs but not for all and will need to be used on the dog prior to the fireworks event so the dog is used to the feeling of the shirt around it. Take your dog for an extra long walk or run to tire him or her out a few hours before the fireworks show starts. Another option is to play with the dog for a longer period of time in the back yard by throwing toys or their favorite ball and having them chase it repeatedly. This will help to get rid of any energy that your dog will have later in the evening. This will help keep the dog calmer. Distracting the dog while the fireworks are going off is another good thing that you can do to help your dog get through the fireworks show. I always use a peanut butter or treat filled toy like the Kong to distract Sophie and it has worked like a charm for years. The best thing that you can do for a dog that has a high level of anxiety when loud noises like fireworks are in full swing is to keep them inside. If your dog is afraid of firework or loud noises like thunder, it's not a good idea to take them outside while the noise is going on. The dog will try to get someplace that makes them more comfortable and at that moment, it is someplace that they can't hear all of the booming and banging. At least with them in a familiar surrounding like the inside of their house, they will feel safer than they would outside. Especially if they are in an unfamiliar place. 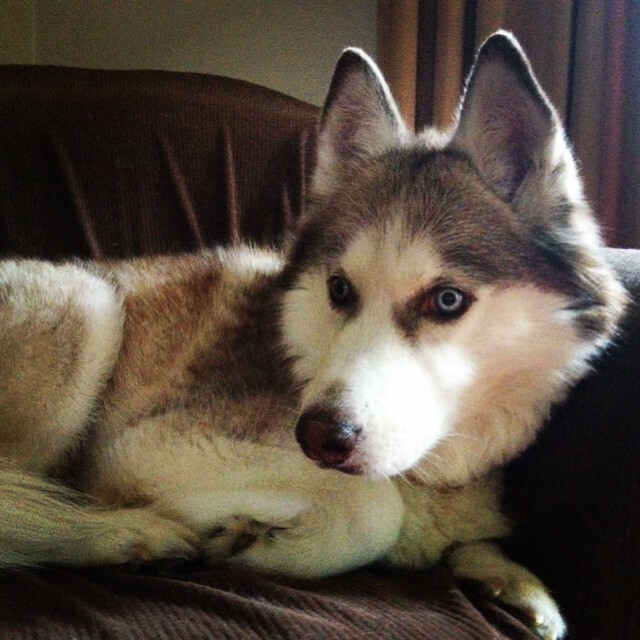 How Much Exercise Does a Siberian Husky Need? Sophie relaxing after a few hours of hard play. Copyright 2017, not for reuse. The Siberian Husky dog has a lot of energy and I do mean a lot. They need to be exercised every day which makes them an excellent companion for families with energetic children and singles that get out and about on a daily basis. If your husky is not getting enough exercise, it can cause some serious behavioral problems. One of the first thing that happens with my husky when she doesn't receive enough exercise is pacing. She will walk through the house non-stop. While it can be annoying, it's not really what I would call a behavioral issue. Destructive behavior is very common with a Siberian Husky that is not receiving enough exercise every day. They will tear something up and these dogs are masters of destruction. I've seen instances where a bored sibe completely obliterated their owner's couch. Then again, I made the mistake of taking a nap because I was really tired and bypassed Sophie's hour long walk and when I woke up the blinds on the patio door were torn to pieces because she was energetic and bored. Digging is another Siberian Husky trait that can come out in dogs that are not receiving enough exercise. While this is not the only cause of your husky turning your yard into swiss cheese, in some huskies, more exercise solves the problem pretty quickly. Walking Sophie in one of our favorite spots. In order to understand the amount of energy and the source, you have to look at this breed's history. These dogs were bread to pull heavy loads across frozen ground. That means that they had to be high energy. The Siberian Husky is like the dog version of a triathlete and as the old saying goes, you can take the dog out of the frozen tundra and their original job but unfortunately evolution hasn't taken away their energy or their urge to run. 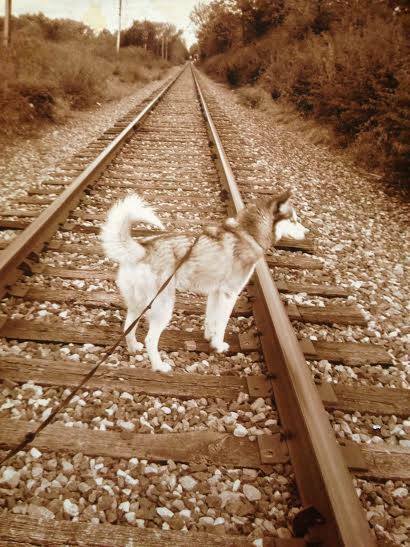 Not all huskies are the same and some do require more exercise than others. Sophie had quite a bit more energy when she was younger than she does today so our exercise sessions aren't as long as they used to be but they are still fun and enjoyable for both of us. Simply playing ball for an hour in the backyard with your husky can help get rid of a lot of your dog's energy. Walks or runs are great too but just remember to keep your dog on a leash or a longer training leash because they have no sense of home and are easily lost. No matter what activity you choose to do with your Siberian Husky to help them spend their energy stores, do something. Help them get that energy out and you'll have a much happier husky and be a much happier husky owner. Don't forget to check out our Facebook page! There are quite a few Siberian Husky owners there just like you! What Should I Feed My Siberian Husky? This site was launched in July, 2012 to help quell misconceptions, spread information and just admire the complete adorableness of the Siberian Husky Dog breed. I add posts a few times a week as I think of them. If you have a question about the Siberian Husky breed that you would like to see addressed here, just leave a comment on the current posting and I'll be sure to answer it for you or join us on Facebook and ask your question there. Copyright 2012, 2013, 2014, 2015, 2016, 2017, 2018 by Lanie Hasquin. Picture Window theme. Powered by Blogger. All Things Husky is a member of the Amazon, Google AdSense and GoDaddy affiliate programs so I may benefit from any purchase that you make off of this website through any links. I do sell and occasionally donate advertising banner space on this site. BUT any reviews that I give are for products that I actually use with Sophie and have paid for myself and are my honest opinion of the product. I do not EVER accept or review sponsored products.